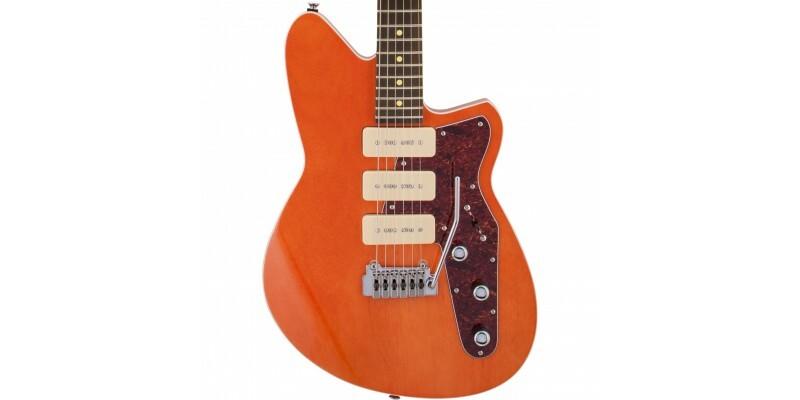 This is the latest Reverend Jetstream 390 in Rock Orange with Roasted Maple neck and Pau Ferro Fretboard. This solid body electric guitar features three Reverend Alnico P90 pickups and a Wilkinson tremolo. As with every instrument we sell, all Reverend Guitars get a full pro check and setup in our Glasgow shop before dispatch. 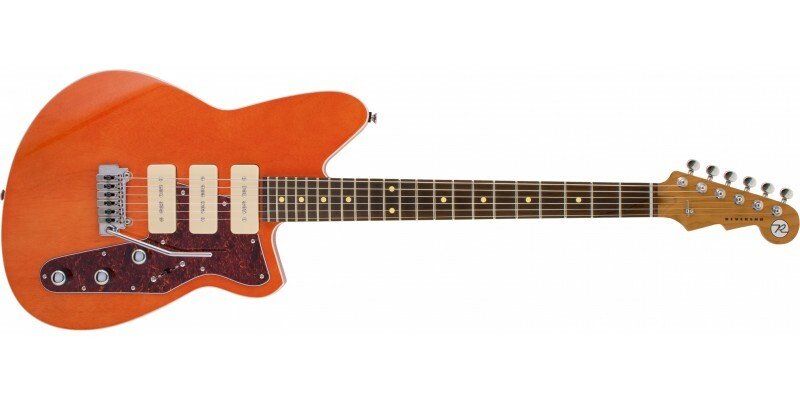 The Reverend Jetstream 390 Rock Orange looks amazing. For us it's one of the stand out models in the Reverend Bolt-On Series. The gloss Rock Orange with tortoiseshell pickguard just oozes cool! Reverend use three of their own Alnico 5 magnet P90 pickups in the Jetstream 390. The bridge pickup is slightly hotter than a vintage P90 offing raw, classic tone with less hum than most other P90's. The middle and neck pickups are cleaner than vintage P90's. They give you a clear, open tone and less hum. The middle pickup is Reverse Wind Reverse Polarity for hum-cancelling when used with bridge or neck pickups. Positions 2 and 4 on the pickup selector deliver classic "quack" but with a thicker tonality. An amazing guitar for both clean and distorted tones with enough twang for surf, but thick enough for rock. The bass contour control really transforms the sound of the Reverend Jetstream 390. Rolled right back it re-voices the pickups giving you some classic and vintage twang. 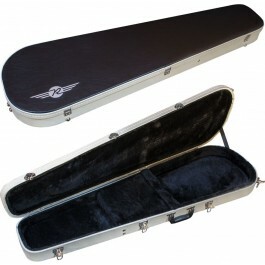 So with the Jetstream 390 you get a trem equipped triple pickup guitar with bags of character and tonal possibilities. 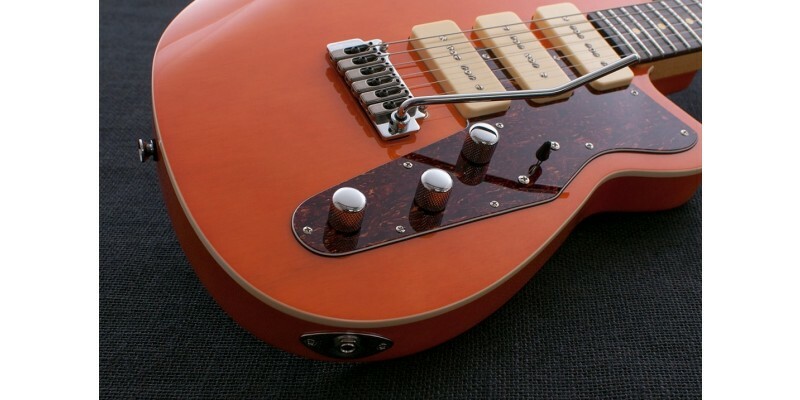 The super cool contoured offset body of the Reverend Jetstream 390 is made from solid Korina. This wood offers many of the same properties as Mahogany but with more consistency and lighter weight. Solid Korina resonates well and makes for a real lively and responsive instrument. The Reverend Jetstream 390 now features a Roasted Maple neck and Pau Ferro fretboard. The medium oval profile is very comfortable. It features a twelve inch radius and medium jumbo frets. Roasted Maple is normally used on custom shop and high-end boutique built guitars. Reverend have brought this material to a price bracket never seen before. This is the smoothest, silkiest neck you will ever feel. Trust us! The Roasted Maple that Reverend have used has been kiln dried to remove most of the moisture. This results in a neck resistant to temperature and humidity. The advantages also include stability and increased resonance. The bridge on the Reverend Jetstream 390 is a Wilkinson WVS50 IIK tremolo. 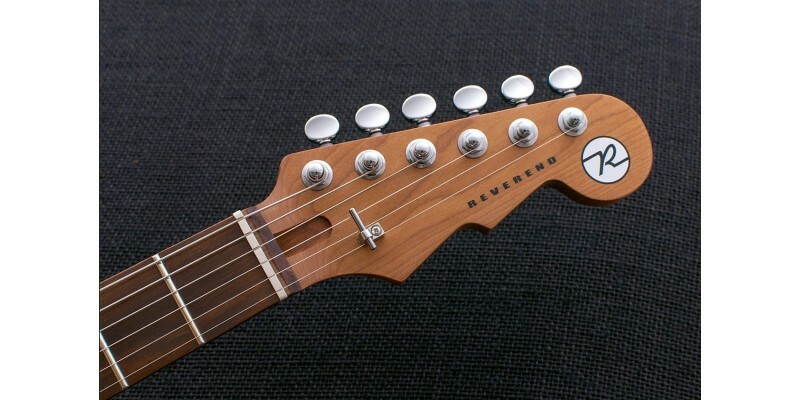 This trem offers superb tuning stability especially when combined with the Reverend locking tuners and boneite nut. You can really go for it with the trem and know that your next chord will still be in tune! The excellent Wilkinson trem features another new Joe Naylor invention, the Vari-Claw. The Vari-Claw allows you to easily switch between 3 springs in the middle hooks of the claw for a firm feel, or 2 springs on the outside recessed hooks of the claw for a soft feel, with little or no adjustment to the claw itself. Throughout 2017 and in to 2018 Reverend have continually upgraded the entire line of instruments. These changes include a new Boneite nut, which reduces friction and has a resonant response similar to that of bone. A new 3 abreast string tree, Etched Reverend logo on the 6 bolt neck plate, new improved contact jack socket and etched jack plate, upgraded pots and electronics, and new lower profile controls. The Reverend Jetstream 390 in Rock Orange with Roasted Maple neck is a real favourite with us in our Glasgow shop. No wonder these guitars get such consistently great reviews. You get boutique quality without the price tag!